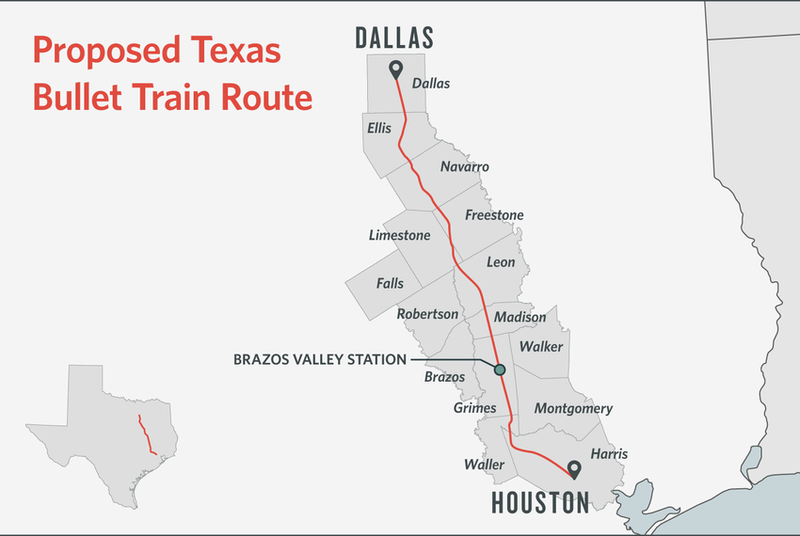 Federal officials identified the likely route a planned Dallas-Houston bullet train will take through rural counties as it connects the state's two largest urban areas. HOUSTON — Federal officials narrowed the possible paths for a Dallas-Houston bullet train down to one likely route Friday, providing an unknown number of rural Texans the most definitive answer so far as to whether their land will be in the path of the controversial project. Countless landowners in the rural counties between Houston and Dallas had been waiting to see where the line will likely go as it moves through their areas. The potential route identified Friday was part of an draft environmental statement that details impacts of the project in particular areas. Texas Central Partners, the private company developing the project, will now present the draft publicly and allow Texans to weigh in on the proposed path. That is expected to happen next year. "We will respectfully follow this public consultation process to ensure legitimate concerns from all stakeholders are addressed," Texas Central CEO Carlos Aguilar said in a statement Friday. Texas Central promises to run high-speed trains that would travel up to 205 mph as they carry people between the state's two biggest urban areas in 90 minutes. The high-speed rail project will require the developer to buy up thousands of properties across the state. Even though Texas Central leaders have long said they hope to work out voluntary land deals with all landowners along the line, much of the opposition to the project centers on the private company’s claim that it has the legal authority to condemn private property if needed. Many officials and landowners disagree with those claims and have pushed local ordinances aimed at stopping the project. But urban business and elected officials have cheered the project, which they say will transform how people travel between the two regions. Texas Central plans to finance the project, expected to cost more than $12 billion, with private investments and possibly federal loans. But the company has long said it will not use any state funds. Ben Leman, chairman of opposition group Texans Against High-Speed Rail, did not immediately return a phone call seeking comment late Friday. Leman resigned as Grimes County judge this month so he could run for the open Texas House District 13 seat being vacated by fellow Republican Leighton Schubert. Lawmakers in the past two legislative sessions filed several bills aimed at killing or hampering the project. The bullet train survived both largely unscathed. But opponents, like Leman, say legal questions remain over whether the company can use eminent domain. The libertarian Reason Foundation predicted earlier this year that Texas Central’s project would not be financially viable and would leave taxpayers on the hook for billions of dollars. But Texas Central says it has spent millions on research that shows there is enough demand for the project to succeed. It has also released a study that showed the project would increase tax revenues for several cities, counties and school districts. “The real work is just beginning,” Texas Central President Tim Keith said Friday. Disclosure: Texas Central Partners has been a financial supporter of The Texas Tribune. A complete list of Tribune donors and sponsors is available here.